Mike Moore | The Journal Gazette Komets forward Mason Baptista controls the puck down the ice in the first period against Kalamazoo at Memorial Coliseum on Wednesday. Mike Moore | The Journal Gazette Komets forward Reid Jackman fights for position with a Kalamazoo defender in the first period at Memorial Coliseum on Wednesday. The Komets are trying to take their game to another level. And they have only 10 games left in the regular season to ascend to it. The Cyclones (46-10-7) have clinched the Central Division title and lead the entire ECHL. The Komets are coming off a pivotal 4-3 loss to Kalamazoo at the Coliseum on Wednesday, when they were burned by turnovers in the neutral zone that allowed the Wings to get within one point of Fort Wayne for third place in the division. The Komets are seven points back of Toledo for second place. 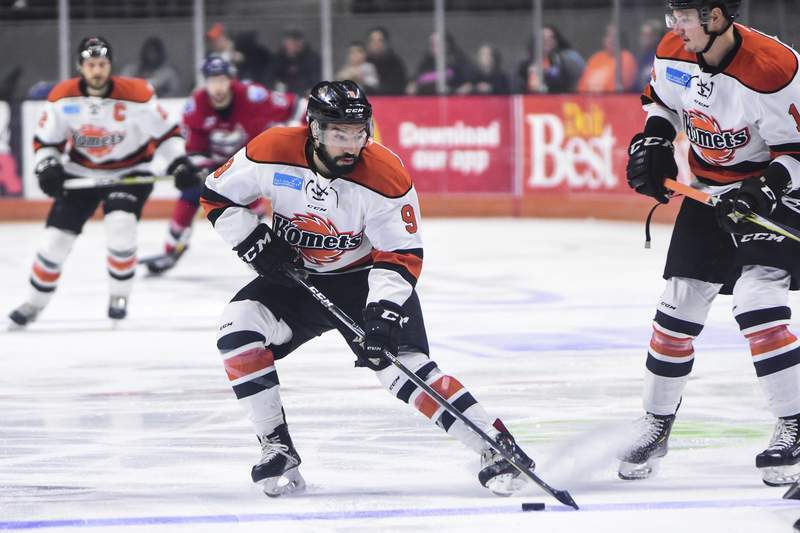 “They want it easy on the outside,” Komets coach Gary Graham said of his players, namely the forwards, who weren't focused on getting the puck deep into the offensive zone to set up possessions. On Thursday, the Komets released forward Gregg Burmaster, who was scoreless in three games. 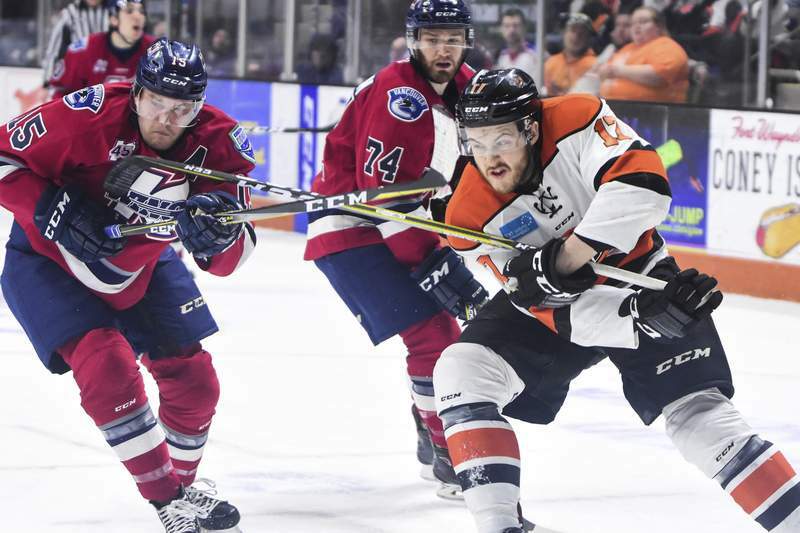 Although the Komets have improved lately, winning five of seven since March 6, they are still looking for more offensive consistency. “Five-on-5, we've got to find a way to generate more scoring chances and get the pucks in the back of the net,” Schaafsma said. The K's play at 7:30 p.m. Saturday in Indianapolis against the Fuel and at 5:15 p.m. Sunday at Toledo. The Komets are a mediocre 21-19-5 against divisional opponents. All but one remaining game is against those teams.